No smoking sign featuring ADA compliant braille lettering. 6" x 9", adhesive backing included. This no-smoking sign features ADA compliant braille, raised letters and graphics, and rounded edges. The blue color offers an alternative to standard black restroom signage. 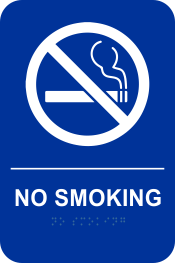 Protect the environment you are responsible for with a NO SMOKING sign featuring a pictogram, text and braille. Sign measures 6" x 9" and comes with adhesive backing for easy installation.